Keeping in mind the changing requirements of clients, we are involved in offering best quality of Carved Wooden Trolley Table. The offered product is manufactured in our advanced manufacturing unit utilizing high grade raw material and sophisticated technology. 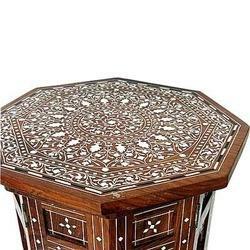 Customers can avail from us a unique range of Wooden Carved Tables. These Wooden Carved Tables are made up of premium quality raw materials that helps in making durability. Available in standard range, these Wooden Carved Tables can be availed in customized forms as required by clients. Different sizes and designs are easily available in the market. 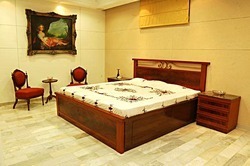 Size of Head board : L 6'-2" x H 4'-6"
Size of Footboard : L 6'-2" x H 1'-11"
Size of side table : L 1'-8" x H 1'-9" x W 1'-5"
Wooden Carved Sofa Set 5 seater.